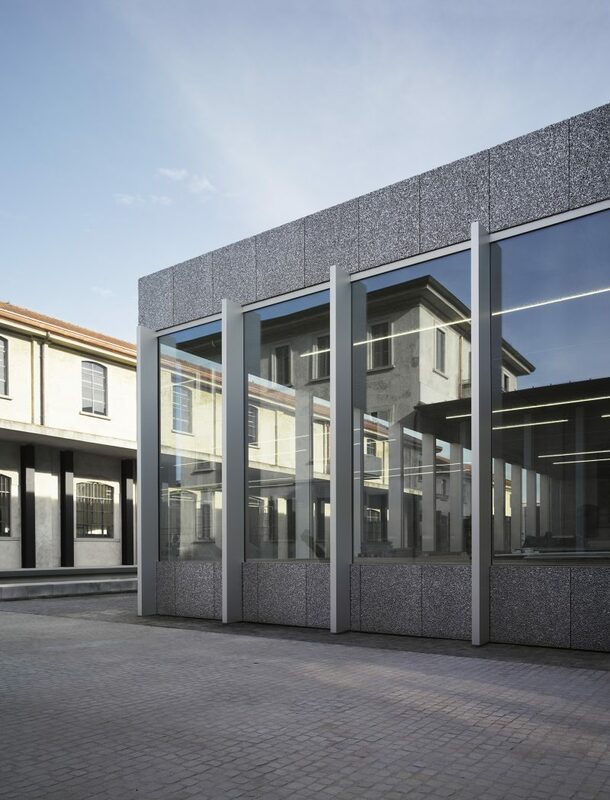 The home of the Prada Foundation opened in May 2015 on the south end of Milan, deep in the heart of an industrial district. This one-of-a-kind cultural hub is housed in the buildings of an old distillery that were renovated into a 19,000 contemporary art center. It instantly captivated the art world and is truly remarkable. The foundation is a reflection of its founder, the legendary Miuccia Prada, a lover of contemporary artwork who has been collecting it for decades with her husband, businessman Patrizio Bertelli. After Venice, the iconic Italian brand set its sights on a distillery from the 1900s located in an industrial wasteland south of Milan’s historic city center. Miuccia Prada entrusted the project to Dutch architect Rem Koolhaas and his OMA Agency, which reinvented the seven existing buildings and added three new ones, including a nine-story tower. This compound is remarkable and daring in its overall composition, brilliantly mixing old and new, not to mention materials: concrete, glass, steel, marble and even 24-carat gold, which completely wraps the exterior walls of a tower. Here there is no predetermined path. The idea is that people can meander through the space as they see fit, moving through courtyards to pass from one building to the next, from a permanent exhibition to a temporary one. Within this campus, each visitor can choose to view at exhibits, watch a film in a comfortable theater, attend a lecture by a philosopher or consult the rare books in the library. A permanent installation by the American artist Robert Gober, the Haunted House, neighbors works by Louise Bourgeois, and the cardboard cave by Franco-German photographer Thomas Demand. There is a temporary exhibit by Kienholze entitled Five Car Stud on view through December 31, 2016. 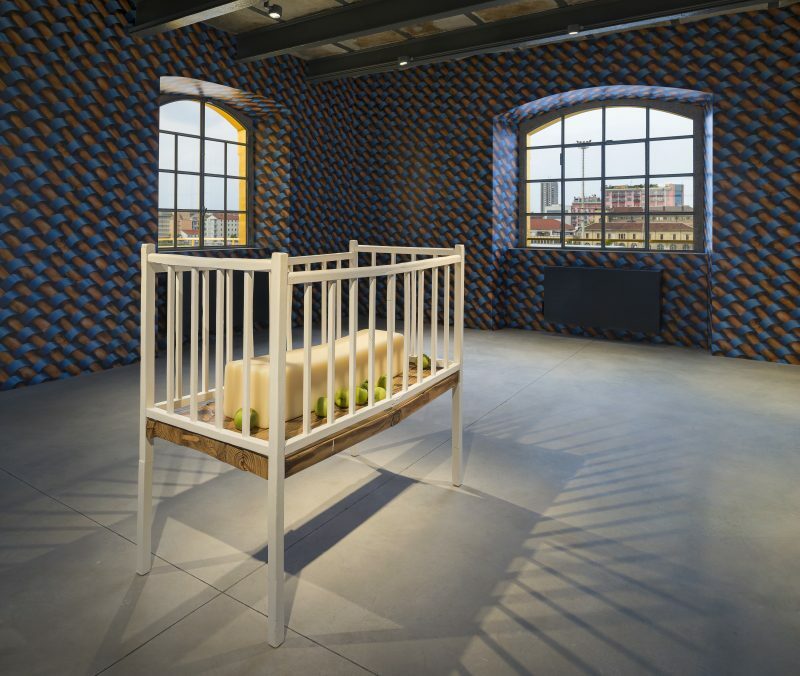 Between these and the movies shown in the theater, Fondazione Prada aims to be a platform for analyzing contemporary culture and flaunts its interdisciplinary interests. It shines a light on all artistic disciplines (photography, architecture, philosophy, dance…) and features installations and performances by artists. The Accademia dei Bambini is a playful, spacious and infinitely adaptable area for children that puts them at ease. It nurtures creativity in kids by offering them a free introduction to the world of art and culture. 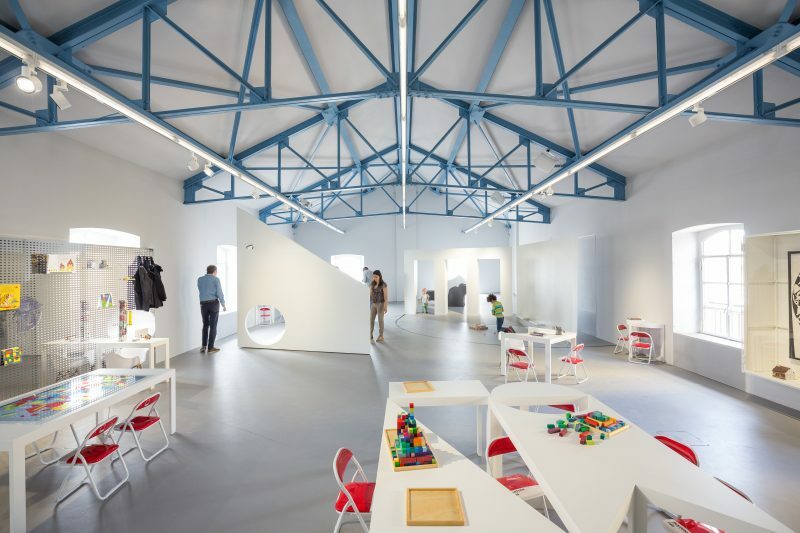 Developed with the National School of Architecture of the City of Versailles and pediatric neurologist Giannetta Ottilia Latis, this haven for creation and development makes for an ideal setting for children to open up to art. With its pastel colors and 1950s Formica furniture, this stylish café designed by the American director Wes Anderson (who played the role of the architect for the project) is the compound’s place to relax. 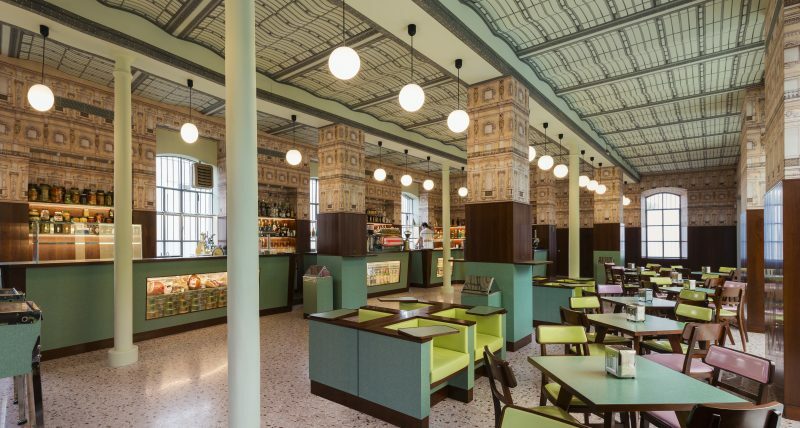 Bar Luce is timeless and antitrendy, where the intense colors and patterned wallpapers – combined with a miniature replica of the ceiling in the Galleria Vittorio Emanuele – make it a café unlike any other. It has just the right amount of kitsch with a jukebox playing Italian hits from the 1950s and a pinball machine featuring Steve Zissou, Bill Murray’s character in The Life Aquatic. Eat a panini, drink a ristretto coffee, talk or read between cultural experiences… Bar Luce is one of those places where you will love whiling away the time. Fondazione Prada, Largo Isarco 2, Milan.